God bless you all for reading, and may He grant the desires of your heart. I’ve been thinking about today’s post for a few days now. I know exactly what I want to say, but I don’t know how to, and I do not want my intentions to be misconstrued. But I’ll present my thoughts as carefully and as lovingly as I can, and let the Holy Spirit do the rest of the work. After all, God placed this on my heart. He does not share His glory with anyone, and His strength is perfected in my weakness. That said, here is today’s post. A few days ago, I saw a post which read “Don’t pray for Nepal”. For the rest of the day, and till this moment, Nepal remains on my heart. Why did God allow the earthquake to happen? I’ve also asked the same question. When my grandmother was sick a few months ago, I earnestly prayed for her to get better. I prayed for five more years. Just five more years, Lord. Just enough time for me to, by God’s grace, start making make a reasonable income and care for her as I would want to. But God said no. She died. My grandmother was born into, and lived most of her life in abject poverty as a subsistence farmer. She had suffered enough in her lifetime, and it was time to return home. I get it, albeit the loss of my grandmother is nothing compared to the devastation of an entire country, and the loss of a few thousand lives. We often ask why God lets us suffer pain and loss. Surely, we say, if He loves us so much, then He must do something about our suffering. But if anyone knows pain, it is God himself. If you doubt that, read through the book of Jeremiah and the book of Lamentations. You encounter a God who is utterly heartbroken and desperate for the love of His people. So knowing how devastating pain is, why then does He let us go through the same thing? Natural disasters and death remind us that God’s thoughts are not our thoughts, and His ways are not our ways- God thinks in terms of eternity. He is God from everlasting to everlasting. But at the same time, He cares deeply about our present human condition. Our lives span just a few decades, compared to a God who has been from time immemorial. God knows, much more than we ever would, that our time here on earth is just a drop in the ocean that is eternity. When we “lose” someone, of a few thousand people, God looks on from an entirely different perspective. His is the “eternity perspective”. He says “My child, your time on earth is done. Come home to me”. When we think about things from God’s perspective, we realize that human life is not in anyway "ultimate". Our time on earth is nothing compared to what God has in store for us. The Bible says that “no eye has seen, no ear has heard, no mind can conceive, what God has prepared for those who live Him”. A brilliant friend of mine, Priscilla, once chided me- “Life is God’s, and He can do with it as He pleases”. I had never thought about that before, and I’m grateful she reminded me. But then, I thought, you certainly do not mistreat what you love. And it’s taken me some time, but I’m learning that death is in no way God mistreating us. Death is a door, a new beginning, the end of one phase, and the beginning of an eternity with God. This is why really, we must repent and accept Jesus into our lives. Please, let Him in. There's nothing like a relationship with Jesus. Nothing compares. He is the best thing there ever was, is, and will be! That said, it is undeniable that pain has a way of crushing the spirit. Pain can make monsters of the most loving people, and push us into a dark, secluded place. One final point- Prayer is not an excuse for laziness or for stinginess. Faith without works is useless. If you have money to support those in Nepal, send the money along. Please and please. 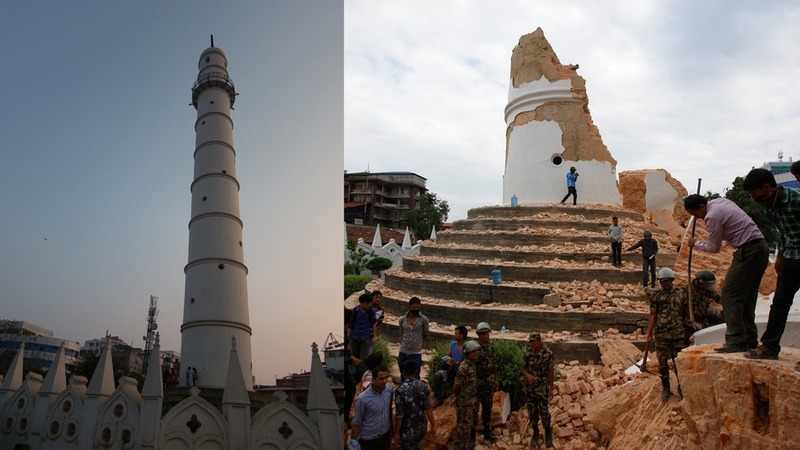 That’s why people are saying “Please don’t pray for Nepal”. Christians have become complacent and we always say “I’ll pray about it”. Prayer does not displace hard work. Prayer does not take away our Christian responsibility to help. Move out, do something for Nepal. Give for Nepal. Donate for Nepal. Pray for Nepal. Where were you while we died? (Half of a Yellow Sun inspired). Alex is dead, Stephanie would have been 21; Dear Alex and Stephanie, you are not just another statistic!